More than 500 children are killed every day around the world as a result of road traffic crashes and many more are injured, often suffering lifelong disabilities. Children living in poorer nations are most at risk; many of these countries lack laws requiring young children to ride in the back seat, be appropriately restrained in cars, or wear helmets while riding on motorcycles or bicycles. Road crashes are also undermining the world economy and keeping millions in poverty. Crashes cost countries between 1–5% of their GDP. Despite this, global road safety is not getting the priority it deserves. A projected 1.7 million people will die from road traffic crashes in 2030, compared to the current figure of 1.24 million. We can prevent children from being killed or injured in road crashes if we take action now. If we lower speeds, increase the use of motorcycle and bike helmets, insist on seat belt use, crack down on drunk driving, and reduce distraction, we can save millions of lives. We must call on our policymakers to pass and enforce comprehensive road safety laws. 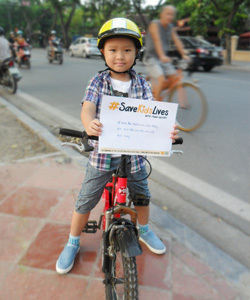 The campaign for this year’s UN Global Road Safety Week is called #SaveKidsLives, in accordance with the theme “Children and Road Safety.” #SaveKidsLives seeks to highlight the plight of children on the world’s roads and call for leaders to take action addressing road safety. AIP Foundation is collecting signatures supporting the Child Declaration for Road Safety, created by asking children for their thoughts on what they need to be safe. 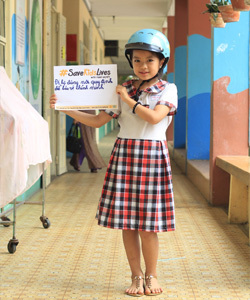 During UN Global Road Safety Week, AIP Foundation and organizations across the world will deliver signed Child Declarations to key policymakers and leaders, calling on them to take strong action in response to this growing epidemic. All of us can take part in this campaign. By signing the Child Declaration for Road Safety, you can show your support and invite leaders and policymakers to take action. You can call for a target in the Sustainable Development Goals to make roads safer for all. Click www.savekidslives2015.org to read and sign the Child Declaration. Take strong action to make roads safer for children. 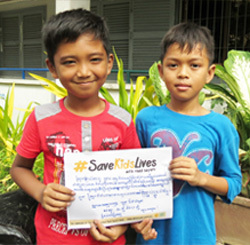 Take action now to #SaveKidsLives.